How I Got This Book: I purchased it myself. In multiple formats. Because I couldn't help myself. 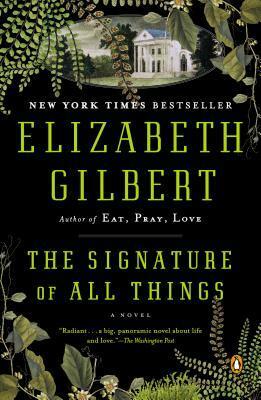 Synopsis from Goodreads: In The Signature of All Things, Elizabeth Gilbert returns to fiction, inserting her inimitable voice into an enthralling story of love, adventure and discovery. Spanning much of the eighteenth and nineteenth centuries, the novel follows the fortunes of the extraordinary Whittaker family as led by the enterprising Henry Whittaker—a poor-born Englishman who makes a great fortune in the South American quinine trade, eventually becoming the richest man in Philadelphia. Born in 1800, Henry's brilliant daughter, Alma (who inherits both her father's money and his mind), ultimately becomes a botanist of considerable gifts herself. As Alma's research takes her deeper into the mysteries of evolution, she falls in love with a man named Ambrose Pike who makes incomparable paintings of orchids and who draws her in the exact opposite direction — into the realm of the spiritual, the divine, and the magical. Alma is a clear-minded scientist; Ambrose a utopian artist — but what unites this unlikely couple is a desperate need to understand the workings of this world and the mechanisms behind all life. Exquisitely researched and told at a galloping pace, The Signature of All Things soars across the globe—from London to Peru to Philadelphia to Tahiti to Amsterdam, and beyond. Along the way, the story is peopled with unforgettable characters: missionaries, abolitionists, adventurers, astronomers, sea captains, geniuses, and the quite mad. But most memorable of all, it is the story of Alma Whittaker, who — born in the Age of Enlightenment, but living well into the Industrial Revolution — bears witness to that extraordinary moment in human history when all the old assumptions about science, religion, commerce, and class were exploding into dangerous new ideas. Written in the bold, questing spirit of that singular time, Gilbert's wise, deep, and spellbinding tale is certain to capture the hearts and minds of readers. One of my friends and I were so excited about reading this book, even before it came out, that we really kind of psyched ourselves out. We were so afraid of being disappointed by our expectations that it took me almost a year to actually read the novel. I loved Gilbert in Eat, Pray, Love and I desperately wanted to love this novel, even knowing that the two would be so different that they might not even be comparable. This friend and I talked about the novel so much that the abbreviation "SOAT" is in both of our autocorrects. Somehow I was finally able to set aside my expectations, hopes, and fears and completely devour the novel. It was fabulous. I loved Alma as a character. I loved how the focus of the novel was on how she was able to find completion and wonder in her work at a time when a woman was a failure if she weren't married with umpteen children by the time she was in her mid-twenties. At the time that I read the novel, I was single, childless, in my mid-twenties, unemployed, with no idea as to what I wanted to do for the future. I'm still single, childless, in my mid-twenties, and am not 100% sure of what I want to do for the future--I did, however, find a job--but I felt and feel better about all of it. Not that I was feeling that bad about it to begin with, but I definitely felt unsettled by all of the question marks in my life. I'll find my passion eventually and the other puzzle pieces of my life will come together eventually as well. And all of that is OK.
Back to the book...I loved the grand, sweeping style in which the novel was written. I felt like I was reading a masterful classic that completely transported me to a different place and time. I think Gilbert's talents of describing the scene in Eat, Pray, Love definitely shine through in her descriptions of setting here. She minutely, but not tediously, describes people, places, and objects. I'm sure that contradicts with "grand" and "sweeping," but it really doesn't when you read the book. Bottom line--The novel was absolutely enchanting and that is why you need to read it. I wasn't so sure about this book... but trust your judgment! I'll have to put it on my TBR! Added to my TBR list! Thanks for the review. I'm not a fan of the 'epic' or sweeping saga so not sure this would be for me. Am a fan or hers though! I did find this book more interesting and nuanced than Eat, Pray, Love. Her writing seems to have matured and I look forward to more ambitious books from her. Daisy Asks for Your Recommendations! A Giveaway Fantasy Fans Are Going To LOVE! September Favorites & October TBRs!